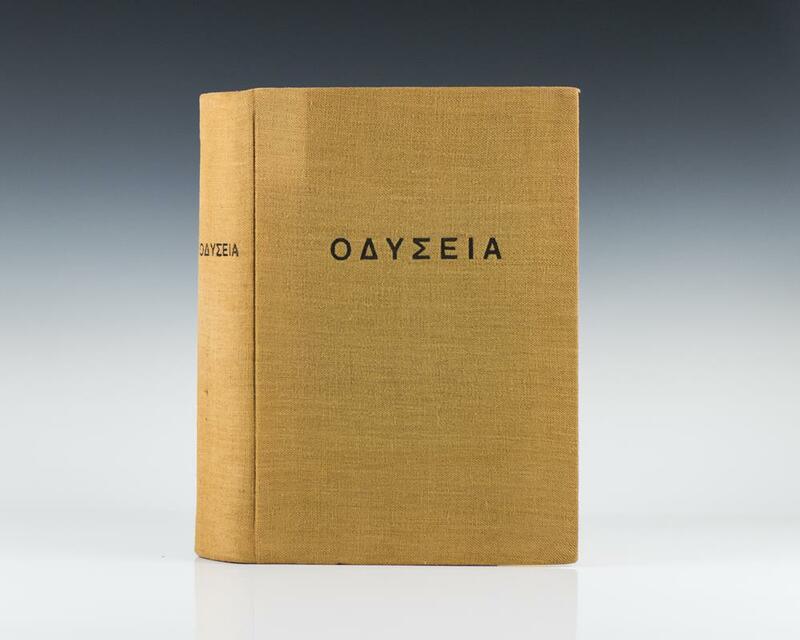 First edition of Kazantzakis’ masterpiece. Folio, brown cloth. One of 277 copies signed by Nikos Kazantzakis, this is number 109. In near fine condition. Nikos Kazantzakis began work on his modern sequel to Homer's Odyssey in 1924, publishing it in 1938 after drafting seven different versions. Kazantzakis considered this his most important work. Following the structure of Homer's Odyssey, it is divided into 24 rhapsodies, consisting of 33,333 17-syllable lines. It was translated into English in 1958 as "The Odyssey: A Modern Sequel." First Greek edition of Christ Recrucified. Octavo, original cloth. In near fine condition. First edition. Octavo, original green cloth. Fine in a near fine dust jacket with just a touch of wear. Translated into English by Kimon Friar; illustrations by Ghika. A very bright copy. Captain Michalis or Freedom and Death. First Greek edition. Octavo, original wrappers. Signed by Nikos Kazantzakis. Near fine in a very good dust jacket with some small chips and wear to the spine. First editions are rare. First Greek edition, preceding all other editions of the author’s most popular novel and basis for the Oscar-winning film starring Anthony Quinn. Octavo, original illustrated wrappers as issued. Signed by Nikos Kazantzakis on the copyright page. In near fine condition with some rubbing to the spine and small closed tears. Housed in a custom half morocco clamshell box. First editions of Zorba The Greek are of legendary scarcity; this is one of the nicest examples we have seen or handled. Paris: Editions Du Chene, 1947. First edition. Octavo, original wrappers. Signed by Nikos Kazantzakis. In good condition, with the signatures originally bound, but lacking the spine. A very rare, early work by Kazantzakis. Kazantzakis, Nikos; Peter A. Bien. New York: Simon & Schuster, 1960. First American edition of this historical novel, basis for the 1988 Academy nominated film. Octavo, original half cloth. Translated from the original Greek by Peter A. Bien. Signed by the translator as follows, “Never in my life have I feared death as much as I feared that resurrection.” Peter Bien Hanover, NH.” Fine in a near fine dust jacket. An exceptional inscription. The Last Temptation of Christ (First Edition in Greek). First edition in Greek, preceding the English translation. Octavo, original wrappers. In near fine condition. Rare first Greek edition of this early travelogue by Kazantzakis. Octavo, bound in half morocco over cloth. In very good condition. First edition in Greek, preceding the English translation. Octavo, bound in green cloth. Signed by Nikos Kazantzakis. In near fine condition. First editions of The Last Temptation of Christ are rare. Kazantzakis, Nikos; Translated by Peter A. Bien. New York: Simon & Schuster, 1962. First edition. Octavo, original half cloth. Translated from the Greek by Peter A. Bien. Signed by the translator on the front free endpaper, “To John “Who knows, perhaps God is simply the search for God.” Peter Bien.” Fine in a near fine dust jacket with a few small closed tears. 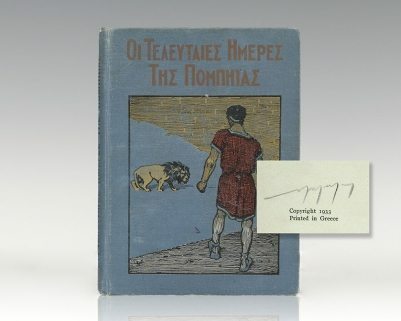 First edition of Kazantzakis’ masterpiece. Folio, original wrappers as issued. One of 277 numbered copies signed by Nikos Kazantzakis this is number 204. A near fine example. Housed in a custom half morocco clamshell box. First edition of this work translated by the Greek writer Nikos Kazantzakis. Octavo, original boards, illustrated endpapers, illustrated. Signed by Nikos Kazantzakis on the copyright page. In near fine condition. Rare and desirable signed. First edition in English, preceding the American edition by one year of the author’s most popular novel and basis for the Oscar-winning film starring Anthony Quinn. Octavo, original cloth. Signed by Nikos Kazantzakis. From the library of Odysseas Elytis, the recipient of the Nobel Prize in literature in 1979. Fine in a fine dust jacket. Translated by Carl Wildman. Housed in a custom half morocco clamshell box. Trade editions signed by Kazantzakis are exceptionally rare.